A rendering of Paseo La Paz in San Ysidro. 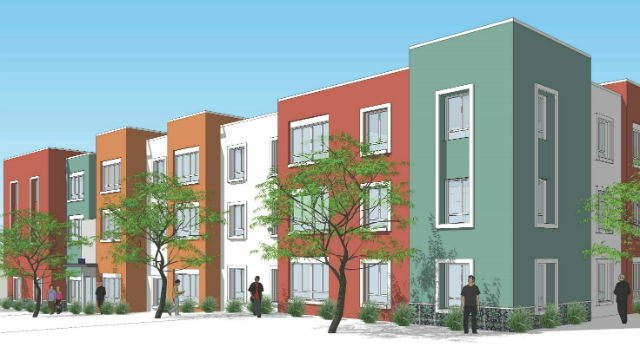 Courtesy Chelsea Investment Corp.
Construction is underway on Paseo La Paz, a 137-unit affordable apartment complex for low-income families across the street from the trolley line in San Ysidro. Chelsea Investment Corp., the San Diego Housing Commission and Casa Familiar are partnering on the $43.2 million project, which is scheduled to open in late fall 2019. Six three-story buildings are being erected with 24 one-bedroom apartments, 79 two-bedroom units and 36 three-bedroom units. The site at 160 W. Seaward Avenue is near schools, a public park and a community center. It’s across the street from the Beyer Street trolley station on the Blue Line. Apartments at Paseo La Paz are for families with income up to 60 percent of the area median income, currently $58,380 per year for a family of four. Rents will range from $856 per month to $1,117 per month. Since 1984, Chelsea has developed 10,228 units of affordable housing at a cost in excess of $2 billion.